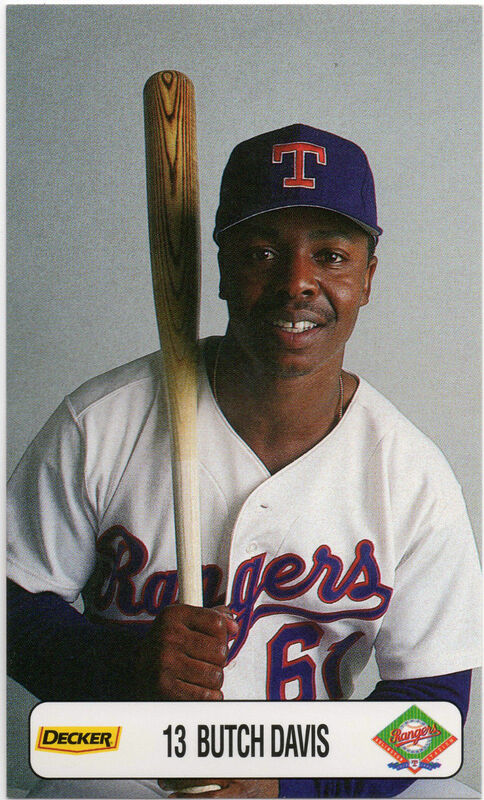 Butch Davis of the Texas Rangers hit the first inside-the-park home run at Oriole Park at Camden Yards on August 22, 1993. BALTIMORE — Brooks Robinson last played for the Orioles late in the 1977 season, a whole generation ago. Cal Ripken wouldn’t put on an Oriole uniform for four more years. Jim Thome is the only present-day Oriole who had even entered the world. Still, the years haven’t dimmed the affection that Baltimore fans continue to feel for the Hall of Fame third baseman. That fact was proven Saturday at Camden Yards by the wild cheers Robinson received when his bronze sculpture was revealed in the final part of the Orioles Legends Celebration Series before the game with Boston. 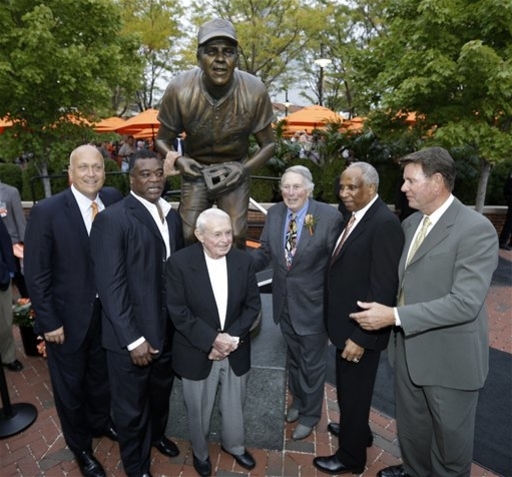 The Orioles already unveiled statues of Frank Robinson, Earl Weaver, Jim Palmer, Eddie Murray and Ripken earlier this season. They’ve been placed in the Legends Area behind center field, just above the bullpens for both teams. There also was a pregame ceremony on the field that also gave the fans a chance to once more honor the club’s legends. Each entered the field by car down the warning track in foul territory along the right-field line. The cars then dropped them off in front of the Orioles dugout, where they walked to their seats on the field near home plate. During Robinson’s slow ride in the car, it didn’t look like he retired 35 years ago. He drew a standing ovation from the large crowd. The fans roared throughout his drive in the car and cheered again when a smaller version of the bronze sculpture was unveiled in front of the pitcher’s mound. The Orioles stood in their dugout watching — as did the Red Sox. Most longtime Orioles fans know something about Robinson’s statistics — and they were staggering. He played 23 seasons with the Orioles and won 16 Gold Gloves, a record total for a position player. He also played in 18 All-Star Games and won the American League Most Valuable Player Award in 1964 and the World Series MVP for his memorable performance in 1970 and made the Hall of Fame in 1983. Robinson still follows the Orioles very closely and talked on Saturday about how this year’s edition has him thrilled with its success. Robinson said the current Orioles really fit his definition of a team, then gave a few comments on the 2012 Orioles. He thinks the bullpen’s strong work is a big reason for the team’s overall success, and he especially enjoys the play of Manny Machado at his old position. Robinson set the standard for third base with the Orioles and everywhere else. His success on the field, and his kind, gentle nature off it, made him immensely popular with Orioles fans as well as others who follow baseball around the country. The 75-year old recently has been battling some health issues but looked fine on this day. The fans were calling out to him, yelling and shouting. And Robinson spent most of his speech at the unveiling of the statue thanking people he played and worked with, deflecting attention from himself. In the end, Robinson said he really likes the idea of the statues in general and being a part of them. Louis Angelos, the team’s ownership representative, spoke to the crowd at the ceremony about how much Robinson meant to the team and its history. 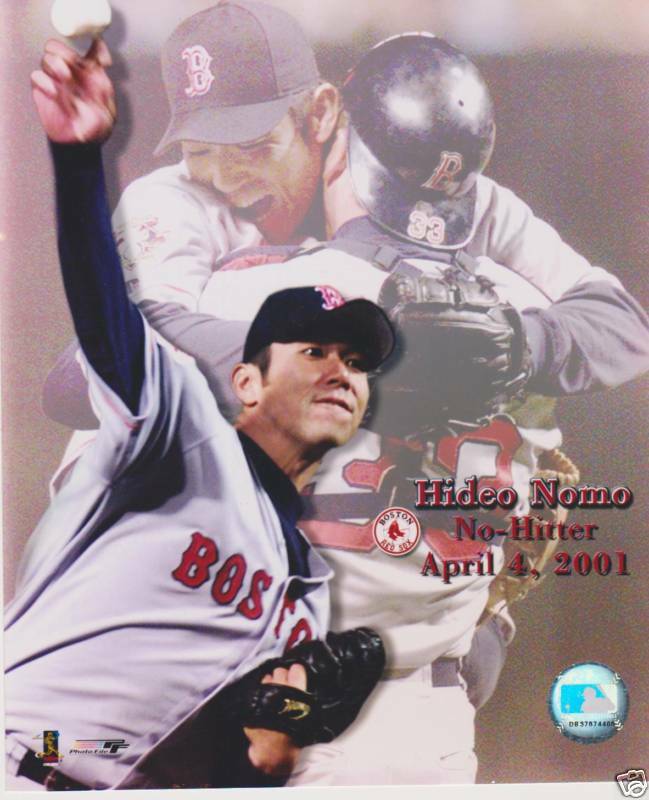 Hideo Nomo’s two career no-hitters are the only no-hit games pitched at two different ballparks. The Colorado Rockies moved into hitter-friendly Coors Field for the 1995 season, and the park’s lone no-hit game was played on September 17, 1996, when Nomo struck out eight Rockies and won 9-0. Baltimore’s Camden Yards opened for the 1992 season and has hosted just one no-hitter, which was on April 4, 2001, when Nomo whiffed 11 batters and beat the Orioles 3-0.